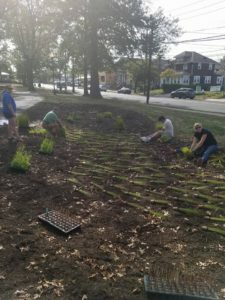 The City of Perth Amboy, in partnership with the Rutgers Cooperative Extension Water Resources Program and with funding provided by the New Jersey Department of Environmental Protection (NJDEP), has launched several new projects in its community-based green infrastructure initiative, Perth Amboy SWIM (Stormwater Infrastructure Management). Washington Park is the site of a new rain garden designed to redirect and absorb rainwater while beautifying the park. 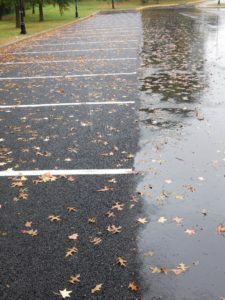 The park’s parking lot is now resurfaced in porous pavement designed to allow rain water to pass through the surface and seep into the ground instead of running off into our stormwater sewers. In addition to the projects at Washington Park, the same partnership is responsible for the installation of two other porous pavement parking lots at municipal parking lot C on Jefferson Street and municipal parking lot RDH on Madison Street. All of these efforts will help us protect our local waterways from nonpoint source pollution, reduce flooding around the City and serve as excellent educational tools for the community. A Perth Amboy SWIM porous/pervious pavement Green Infrastructure project at Washington Park. October 9/2017 was the first rain. Rain water is allowed to pass through the asphalt & soak into the soil rather than flood the neighborhood. Photo Credit: Raritan Riverkeeper.